Our ASIA 100 reports evaluate the research performance of Australasian and East Asian universities. They are designed to help university leaders and policymakers understand which Asian universities are best at research, which are most engaged with industry, and which institutions deserve the strongest reputations relative to their scale. These reports build upon standards set in our other BARLOW REPORTS, which have been widely subscribed to across the Australian higher education system. ASIA 100 - Benchmarking University Research in Oceania and East Asia (2016) grades the research capabilities of universities around the region in 60 key disciplines. It identifies the top 100 universities in each discipline using an algorithm based upon research outputs, citations, high-impact papers, international engagement, and industrial collaboration. ​It provides new tools for thinking about institutional scale, focus, and differentiation in the rapidly changing Asian context. It helps decision-makers understand the trade-offs required to stand out in a competitive environment. Running at over 400 pages, and including hundreds of tables and figures, it is a comprehensive tool to support clear thinking about university research portfolios. 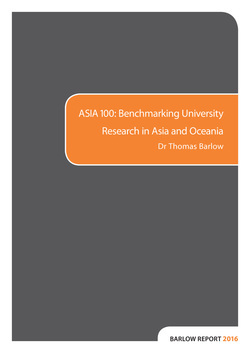 ASIA 100: Benchmarking University Research in Oceania and East Asia (2014) studied the changing performance of universities around the region across 21 fields of research. It highlighted the dramatic growth in Asian research capability, and the shifting patterns of international collaboration. It evaluated the impact of regional university collaborations on research quality and visibility, and showed how changing patterns of business R&D investment are influencing university collaborations with the private sector. It also emphasized the trade-offs that universities must make in balancing the volume and quality of outputs, in choosing whether to focus or diversify research portfolios, and in differentiating from competitors while also pursuing partnerships with top institutions.